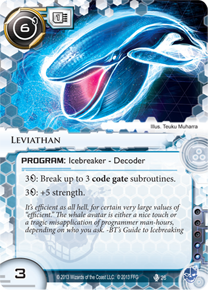 The first part of this article is to help experienced Android: Netrunner players teach new players how to play. In the second part, I will give my recommended learning decklists and more specific explanation. 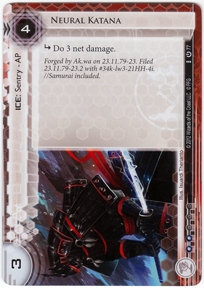 Your first goal should be to provoke interest in Netrunner and make sure that you’re teaching someone that wants to learn. It’s best to know your audience. An ex-Magic:The Gathering player might be interested in the card combos while a new player at a board game convention might find the theme compelling. Identify your audience’s interests before showing how Netrunner applies. 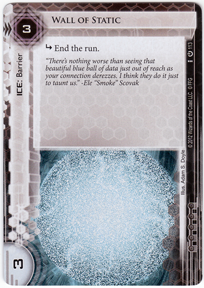 Also recognize that Netrunner isn’t for everyone. While someone coming from playing Apples-to-Apples might be fascinated by the bluffing and player interaction in Netrunner, it could just as easily be the case that they aren’t interested in deep strategy or deckbuilding. If a player expresses interest in customization, explain the diverse deckbuilding options; if they are interested in bluffing and risk, explain how games can be dramatically won or lost through traps and player interaction. Netrunner is a 2-player cyberpunk living card game with one side playing a corrupt mega-corporation trying to advance their agenda and the other side playing a hacker trying to infiltrate the corp. The two players have completely different decks with different kinds of cards and the first player to 7 agenda points wins. 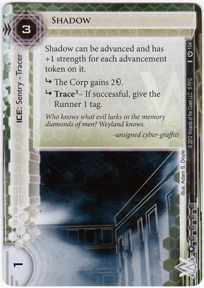 Whereas the corp can earn points by advancing their own agendas, the runner can only earn points by stealing from the corp.
After a new player expresses interest, you can begin explaining the basics of Netrunner. At this point, you can touch on clicks, credits, damage, and other foundational concepts to familiarize the new player. Once you start teaching, it should take about 20 minutes (30 for your first teach). If you find that you are finishing in under 10 minutes, your instructions probably aren’t optimal for all but the most experienced card game players. On the other hand, it shouldn’t take more than half an hour–don’t underestimate the amount of learning that comes by simply playing. 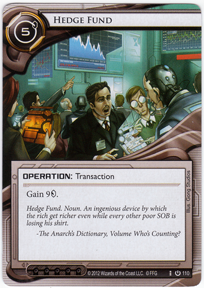 I advise letting the new player play as the corp so they will have more information about the most important cards in the game: agendas. 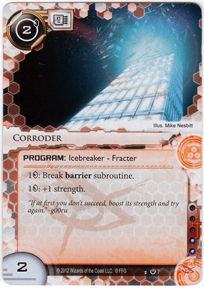 The Corp also has access to more information in general and much of the runner’s role is guessing what cards are face-down–quite difficult to do if they haven’t seen any of the cards before! Being able to check face-down cards and plan accordingly is useful for new players. The corp’s scoring method is more traditional than the runner’s and will be more familiar to a new player. Also, if the new player has played other card games before, they will be used to drawing at the beginning every turn–not doing so will seem unintuitive. Ice is integral to runner-corp interaction; Ice is the front (and usually only) line of defense. You should explain that there are three basic types of ice (Don’t worry about subtypes and other types like trap ice): Barrier, Sentry, and Code Gate. Barrier is the simplest type to understand; barriers usually end the run, often to the exclusion of all else. Wall of Static is a typical barrier. That’s what you get for beaming your TV into space and back. Sentries are focused on punishing the runner through trashing programs, giving tags, or doing damage. Neural Katana is a common sentry. Wait until they release Neural Naginata, then you’ll be sorry. Code Gates are a little odd. 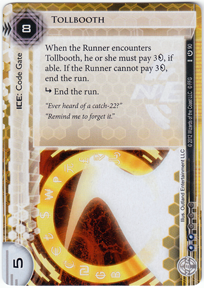 Sometimes they end the run, like with Tollbooth; sometimes, they tag the runner, like with Salvage; but they usually have unique effects that change the basics of the game, as with Hudson 1.0. There are a couple other key points to touch on when teaching about ice. Make sure to explain that not all ice ends the run, a common misconception. Hunter is a good example of ice the runner can encounter without ending the run. Likewise, the runner does not have to break every subroutine on every piece of ice. Often, the subroutine may not affect anything or may not be worth the credits to break it. Similarly, there is nothing preventing the runner from running through a Shadow without a sentry-breaker (Killer). 11-advanced Shadow for when you REALLY need those 2 credits. 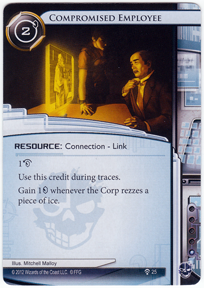 After explaining ice–and thus all the types of corporation cards–you can explain the runner, starting with icebreakers. Icebreakers are some of the most important cards a runner has and one of the most important things to teach a new player about the runner. You can explain that most Icebreakers are able to spend credits to boost their strength and all are able to break subroutines. Using a simple icebreaker like Corroder or Gordian Blade as a baseline, you can show how to break a couple different pieces of ice. Almost as corrosive as Coke. Make sure to note that the strength is temporary, and doesn’t usually last for the next piece of ice. Also make sure to explain the four types of icebreakers: Fracter, Killer, Decoder, and AI. Show how these icebreaker types match up with the three types of ice. After explaining icebreakers, you should explain how the runner gets the money to pay for the icebreakers and other cards. Show each type of runner card (e.g., Event, Resource) and explain cost and other elements of the card the same way you did for the corp. It helps to draw parallels to corp cards with different names but similar effects. For example, you can point out that Events are basically the same as Operations and Sure Gamble is basically the same as Hedge Fund. Your explanation of the runner should be shorter and take advantage of the basics established during the corp explanation, especially if the new player isn’t the runner. It’s a win-lose. I win, you lose. Throughout teaching, it should already be apparent how much fun Netrunner is and how much you enjoy it. You want your enthusiasm for the game to show; if you’re excited, the new player will be more excited too. While you may want to share all the best combos and intricate strategies, one of the most important things is that you don’t overwhelm the new player. With that in mind, here are some general guidelines to smooth the teaching process and for everyone to have fun. 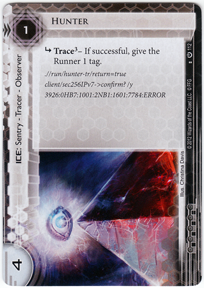 Netrunner’s terminology can be confusing, especially to new players. What’s the difference between the grip and heap? Where are the Archives? And why are all these connections in my rig? Avoid using jargon at first, instead referring to R&D as “the deck” and clicks as actions etc, and answer any questions about specific terminology when they come up. At least it wasn’t the other kind of compromised connection. Remember, the point of a teaching game is not to win! You shouldn’t throw the game, but you might want to consider playing sub-optimally on purpose while the new player learns how the game works. If you do this, don’t make it obvious; instead, approach the game differently, perhaps using strategies you consider sub-par. You can even discover strategies that you wouldn’t have thought of before! Have fun! If you’re not having fun, it’s even less likely that the new player is. Be complimentary, but not condescending. Congratulate any good plays the new player makes or any combos they capitalize on. Don’t make them feel like they are just catching up to you knowledgewise or scraping the bottom of Lake Noob. Fig.1 : A recent denizen of aforementioned aquatic origin. Be patient. They will not play as quickly as you are used to and that’s ok. If your game takes an hour, that’s fine. Be a good sport. This goes for all games, but especially applies with learning games. Don’t sour their perception of the game with bad sportsmanship. If they use a powerful card, don’t call it overpowered; if they win as the runner, don’t say that the runners always win etc. Join me for part two when I give out my learning decklists. Good luck bringing new players into the game and let me know any teaching tips you have in the forums!